One Day and Back Then (Standing), 2008, color photograph, 30 × 40”. Images courtesy of the artist. Recently, just before participating on an artists’ panel with Xaviera Simmons, I overheard her mention that her upcoming presentation consisted of over 100 images. I didn’t care so much about time, but even a brief explanation of each image seemed like a lot to get through. In the end, her presentation was no longer than anyone else’s; it included the work of William Eggleston, Joan Jonas, Stephen Shore, Paul McCarthy, and many others. Simmons had purposefully placed images of her own work in the middle of, say, Eggleston and McCarthy. Like Simmons, Eggleston is attuned to traditional questions of composition, color, scale, and finding beauty in the mundane. McCarthy is a formalist who puts forth the extreme surface of the objectively absurd. I liked how her own work—articulations of the “appropriative-real” andthe “staged”—wound up situating her right in between these two strategies. From the series If We Believe In Theory, 2009, color photograph, dimensions variable. Simmons, as an artist, doubles down. She captures the fiction/truth dialectic as well as anyone, disarticulating assumptions about the quietly composed and staged images she makes. She’s a Brecht of the photographic endeavor. In her work, Simmons is not so much documenting the performance before the camera, but the performance itself. In one image from the series If We Believe in Theory , Simmons captures a young girl in the woods dressed like Little Red Riding Hood. It’s an example of Simmons using the suggestion of performance to capture the explicit and contradictory nature of individuality. Her subject becomes herself, and also a dismembered characterization of what we’re accustomed to look at. Still, it is not simply Simmons’s understanding of the imagistic theater of photography that is useful, but her way of using form to acknowledge that image is at the center of the creative construction of collective and personal histories. Simmons is a lexicographer who fuses live material and conceptual conceit; she deconstructs and retains a relation to specific times and places. Perhaps paradoxically, she often achieves this through unabashedly excessive detail, like in One Day and Back Then (Standing) , where her character stands in a field of sea reeds in blackface, looking out at us, wearing all black (including stiletto boots), ready for a night out on the town. As comfortable with taking a picture as she is with producing a theater piece or performing a DJ gig, she makes work that is perpetually in flux. Often one of her images will seem like the precursor to another manifestation of her work. For the photograph Jaamburr, an 18th-century African American coinage meaning “free black,” Simmons photographed a college-aged man sitting up in bed, pen in hand, writing in a notebook. Newspaper pages cover his wall. The image reminds me of Electric Relaxation , an installation that Simmons exhibited at the Contemporary Arts Museum of Houston (and previously at Art in General in New York) where hundreds of jazz, hip-hop, and soul LPs were affixed to the wall in a loungelike environment where viewers could relax and listen to the music. The installation created a decidedly literary space, a text commanding a problematic read, like the paper clippings that could have represented a theoretical extension of or a literal opponent to a young man’s mind. The Artists on Artists Series is sponsored by the W.L. Lyons Brown, Jr. Charitable Foundation and the New York State Council on the Arts. Adam Pendleton is a New York based artist. His work is currently on view in The Generational: Younger Than Jesus at the New Museum in New York, and he is presently one of the artists in residence at the Studio Museum in Harlem. 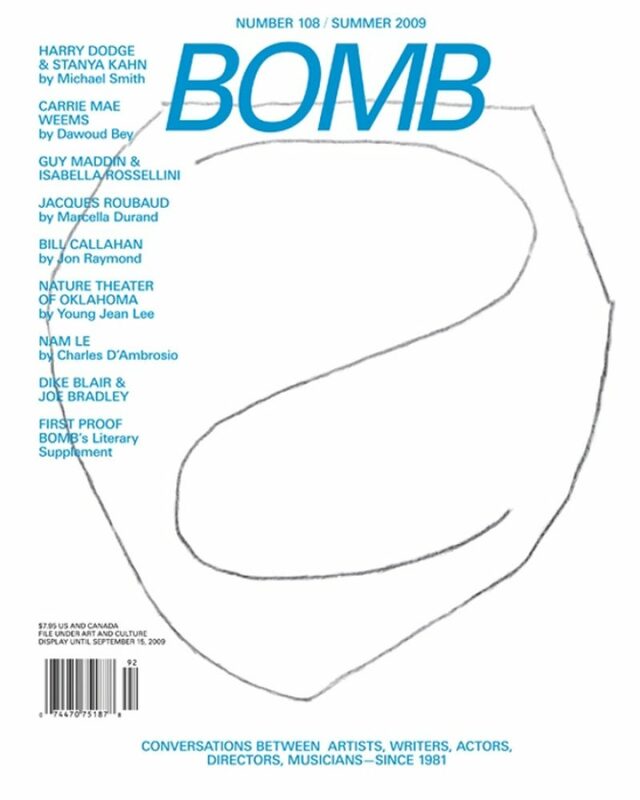 Featuring interviews with Dawoud Bey, Dike Blair and Joe Bradley, Harry Dodge and Stanya Kahn and Michael Smith, Nam Le and Charles D’Ambrosio, Guy Maddin and Isabella Rossellini, Bill Callahan and Jon Raymond, Pavol Liska and Kelly Copper, and Jacques Roubaud.